Escape the Ordinary at the NEW Booby Trap Escape Rooms! Are you looking for a unique and interactive family or team building experience? 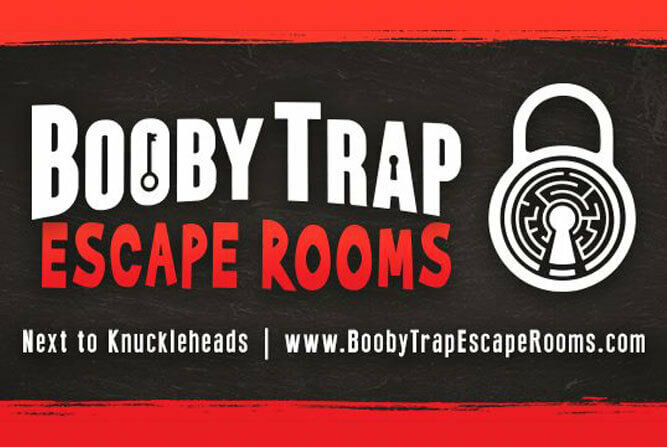 Check out the newest Escape Rooms at Booby Trap next to Knuckleheads! Put your puzzle solving skills and teamwork to the test to see if you can accomplish your mission and free yourself from one of several different themed rooms. All of the rooms are fully-immersive and last about 60 minutes. Booby Trap Escape Rooms is fun for all ages and a great way to bring any group together… you’ll discover skills that you never knew your family, friends, and co-workers had! Don’t worry about getting stuck or feeling claustrophobic- you’ll have a dedicated gamester during your entire experience to make sure you are having fun and to give clues if you need them. Currently there are 4 themed rooms to choose from, all varying in puzzle styles and level of difficulty. Select whether you’ll try your hand at escaping from the hot sands of the Egyptian desert in the “Pharaoh’s Revenge” challenge, uncovering the mysteries of the universe in the “Singularity” room, solving the mystery of a “Mayday” submarine, or unraveling the puzzles left behind by an airship pilot and inventor in the “Inventor’s Workshop”. No matter which room you choose, you’ll work together to find the clues, solve the puzzles, and escape… if you can!